The Three castles Walk is a circular route of about 19 miles. It takes the walker through wooded hillsides and hidden valleys. The country side in this area retains its hedgerows and maze of lanes, tracks, bridleways and paths. The walk links the three Norman castles of Skenfrith, White and Grosmont. The remains of the castles are situated in picturesque surroundings, the best preserved is White Castle, which is surrounded by a wide moat. The Three Castles Walk booklet contains the route and information which can be obtained from local tourist centres. The Offas Dyke long distance footpath runs from Chepstow to Prestatyn for 168 miles through varied landscapes of the Welsh Marches. 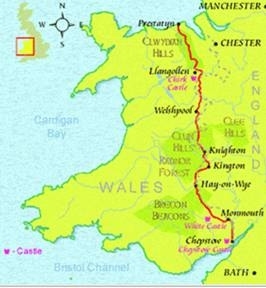 The Dyke constructed by King Offa of the ancient Anglo Saxon Kingdom of Mercia, was to divide feuding kingdoms in what is now Wales. Some sections remain and still form the Welsh – English border today. The Offas Dyke offers something for everyone, whether it’s a gentle stroll for a couple of hours or the whole trail for two weeks you are guaranteed spectacular countryside. The Dyke passes through historic towns, you will discover castles country churches and plenty of wild life.